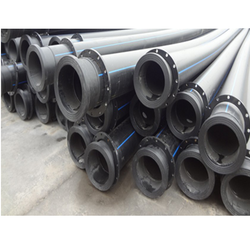 Dredge pe pipes are manufacturers by pe 80 and pe 100 raw material. These are basically HDPE PIPES with flanged on both side. Flanges can be lap flange or skip slipon flanges. Pipes are used to transport a flow of material from the suction area to the discharge area. They are subject to wear, impact and pressure. High breakage resistance is essential. - Length: Available in straight lengths of 6/12 meters for all size and in coils upto 140 mm. OD size. High Impact polyethylene floats with jointing system. Marine Grade raw material is used for construction of eco-friendly foam filling.